RhinoV3. 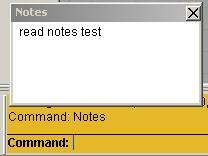 NOTES very well known option to store some extra info in the 3DM file, cool, but how to read that info without opening a 3DM file? Just needed for one of my projects so below is that "dirty" solution !